The Canadian climate is hard on your vehicle—and at any given point in the year, it’s being attacked by extremes of heat and cold, damaging UV rays, sand, salt, snow, ice, rain, and plenty more. Like all parts of your vehicle, windshield wiper blades take plenty of abuse in every season. In summer, hot temperatures, the bright sun, dust, and bugs can wear on rubber wiper blade surfaces. In winter, extreme cold and abrasive ice, salt and sand conspire to wear your rubber wiper blades out in quick order. How long do wiper blades last? That depends. If you live in a warm, sunny climate where your wiper blades see little use, changing wiper blades is likely required less often than if you live in most parts of Canada, where you’ll often use your wipers in very harsh conditions. Here, the expected useful lifespan of a set of windshield wiper blades is about 6 months. Put simply, when it’s time to switch between summer and winter tiresit’s probably time for a new set of wiper blades, too. Worn-out wipers can be a mild inconvenience, a major safety hazard, or anything in between. When windshield wipers are worn, they tend to lose effective contact with the windscreen, leave streaks, leave portions of the swept area uncleared, or begin to exhibit missing pieces of rubber from the blade surface. Even a small amount of wiper blade wear can dramatically reduce visibility in poor weather, affecting your vision comfort, safety, and situational awareness. Thankfully, signs of a worn-out set of windshield wipers are often obvious: visible pitting, cracking or damage to the rubber blade surface, or a poor-quality wipe that never quite seems to clear the windshield. Worn wipers can also reduce the effectiveness of the washer fluid you rely on to help quickly clear ice from your windshield. The wipers will have trouble properly coating the windshield with fluid to melt through the snow and ice stuck to your windscreen. Further, reduced outward visibility through the windshield can reduce the effectiveness of vehicle safety and hazard-detection systems—as these often rely on a clear outward view from an internally mounted camera. A few bad habits and unfavourable situations can contribute to rapid windshield wiper wear, too. These include running the wipers on a dry windshield, allowing the wipers to drag over ice that’s stuck to the windshield, and not using enough washer fluid spray to properly clean a dirty windshield. Using wipers in salty or sandy conditions where small abrasive particles chew up the rubber blade surface may be inevitable, but that causes accelerated wear, too. Careless use of a windshield scraper on cold mornings can even cause damage to wiper blades if the sharp scraper contacts the wiper assembly. 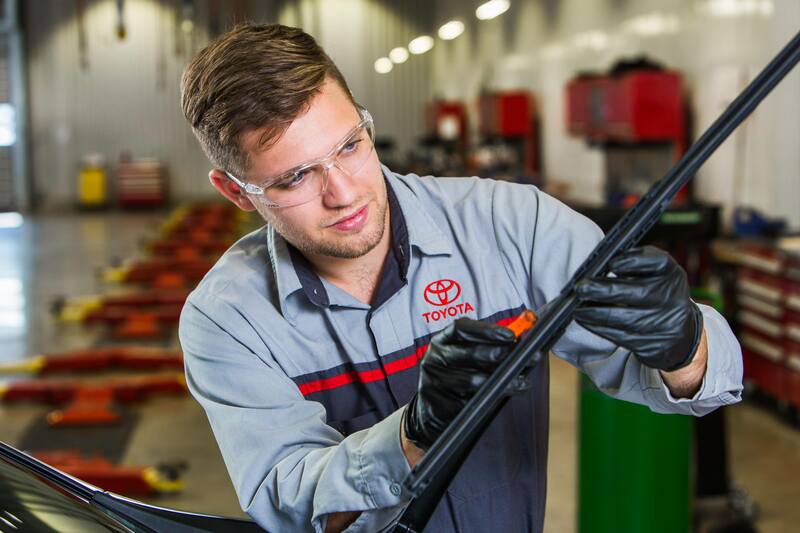 Using a quality set of windshield wiper blades at all times is a great idea, and that’s why your local Toyota dealer stocks a variety of genuine Original Equipment Manufacturer (OEM) wiper blades that are designed, tested, and engineered to the same quality standards as the Toyota vehicles they’re built for. Toyota Genuine Wiper Blades are available in two styles: Genuine Hybrid Wiper Blades, and Genuine Winter Wiper Blades. These innovative hybrid wiper blades have an all-new “crossover” style, which provides the superior wiping performance of a beam blade with the added protection and styling of a hinged shell encasing the wiper. Toyota Genuine Winter Wiper Blades will help keep you safe in the worst winter conditions. They are specially designed to keep slush, snow, and ice off your windshield, and feature a sleek, wedge-shaped spoiler to help clear away loose snow and ice buildup.